In order for our plants to grow we need fertile soil. Most of the land on earth is covered with soil. There are different types of Soils due to all rocks are not the same. 1.) Sandy Soil - is light and dry with air gaps to allow water to drain through quickly. It feels gritty to the touch. 2.) Gravel Soil - is full of small stones which allows water to drain through quickly. 3.) 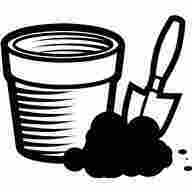 Clay Soil - is very sticky and lumpy when wet which makes it a heavy soil and it is rock hard when dry. It does not allow water to drain through quickly. This soil absorbs and retains more water. Humus is a rich, dark, nutrient-rich soil. It creates a loose structure that holds moisture (Air) and drains Water well to support living plants. This rich, dark soil is made from plant debris, dead animals and other organic matter that decomposes on the ground (such as insects, worms and termites as they live, eat and die in the soil).